If you’re anything like me then you love globes and can stare at a map for hours on end. It’s a wanderluster thing where you’re constantly looking for cities and small villages to explore for your next trip. I really can’t go a day without thinking about my next destination. You have the wanderlusters, and then you have the wanderlustees who have fallen in love with a city and can’t find it in them to leave. We all have our favorite town, city, or country and are proud virtual ambassadors. 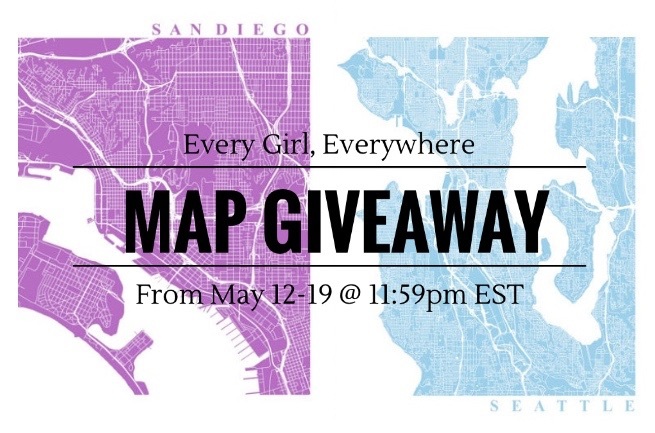 So that’s why I’m so excited to announce Every Girl, Everywhere’s FIRST GIVEAWAY! In partnership with The Map Collection we are able to give one lucky winner a handmade, customizable map of their choice. Enter to Win in One Easy Step!  Subscribe to Every Girl, Everywhere for updates on travel tips and giveaways. All EGE subscribers get 15% off their purchase!  Follow Every Girl, Everywhere and The Map Collection on Pinterest. This giveaway will be from 5/12, ending on 5/19 @ 11:59EST. The winner will be announced on 5/21. This giveaway is open to everyone all around the world. Kollin is an avid traveler and entrepreneur. When she's not working as a Marketing Consultant, she's strategizing ways to make Every Girl, Everywhere even better. She's passionate about helping people, traveling and living the best life possible. To inspire women to pursue their dreams of travel through stories, tips, and videos created by women, for women.